Posted in Stress Management on April 13, 2012. Last modified on February 01, 2018. Read disclaimer. Isn't it interesting how a person may be "feeling blue" or "tickled pink?" They can be "yellow-bellied, chicken-livered" (to quote John Wayne in Red River) or "green with envy." They can get caught red-handed or... well, you get the idea. Just the concept of a color is often able to describe our emotions or actions. DesMoinesHealth.com is a participant in the Amazon Services LLC Associates Program, an affiliate advertising program designed to provide a means for sites to earn advertising fees by advertising and linking to amazon.com. Colors also have the ability to influence our behaviors and send out subtle messages about us. For instance the color red says, "stop!" (in the case of a red light, stop sign, or the red button on machinery) but it can also signify a feeling of confidence (such as wearing a red dress) or a desire for excitement (as if we drive a red car). Blue is almost universally seen as calming and reassuring. The symbolism of other colors, however, often varies more widely. Yellow, for instance, is associated with happiness in the US but mourning in Mexico. Likewise, here in the US, we've linked the color black with sadness and mourning yet white has that unfortunate connotation in China. Genetics: when we see a color, our endocrine system secretes certain hormones into the blood stream. The type and amount of hormone, however, is determined by our genes. Past associations and memories: if you had a childhood teacher who often wore a plum colored dress, that color may bring up ill feelings throughout the remainder of your life. Age and health conditions: Diabetes, glaucoma, and macular degeneration are just a few of the more common diseases that can affect how we differentiate between colors. There is a rare condition however, known as Achromatopsia which affects 1 in 30,000 people, that can completely nullify colors so that everything is seen in black, white with shades of gray. In addition, the lense of our eye naturally yellows as we age. And this makes it harder for older people to identify blues, greens and violet. It also makes these colors look darker and more yellowed. Product marketing: Companies like McDonalds and KFC take advantage of red's ability to stimulate appetite through their heavy use of this color in their signage and packaging. In schools, offices, hospitals and workplaces: red and other "warm" colors tend to increase stress, heart rate and raise blood pressure so they often lean toward the use of blue and other "cool" colors. This creates a more relaxing environment, makes rooms seem larger and cooler, and can even cause to people underestimate time. Engineering and infrastructure: bridges are sometimes painted blue, since blue's sedating property may discourage suicide jumping. 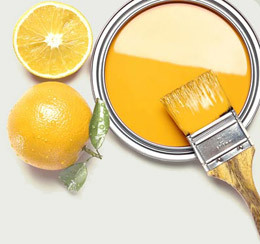 In the home: yellow is happy, optimistic and uplifting so it would be a good choice for the kitchen but avoid it in the nursery; babies cry more in yellow painted rooms. In healthcare: blue lights are effective in treating infants with jaundice. Exposure to white light is used as a treatment for Seasonal Effective Disorder. The color green stimulates antigens which support healing. In sports: Whether it's bias on the part of officials or the players' self-perception, teams that wear black (commonly associated with evil in the US) receive more penalties than teams with no black. And teams that change from no black to black statistically see an immediate increase in penalties. No use of color in sports, however, may be as novel as the pink visitor's locker rooms at the University of Iowa's Kinnick Stadium. Originally conceived by coach Hayden Fry because of its calming effect, pink's association with femininity was undoubtedly also a consideration. In fact, studies have found that very vivid pink stimulates the secretion of norepinephrine in our brain, which in turn, diffuses anger. 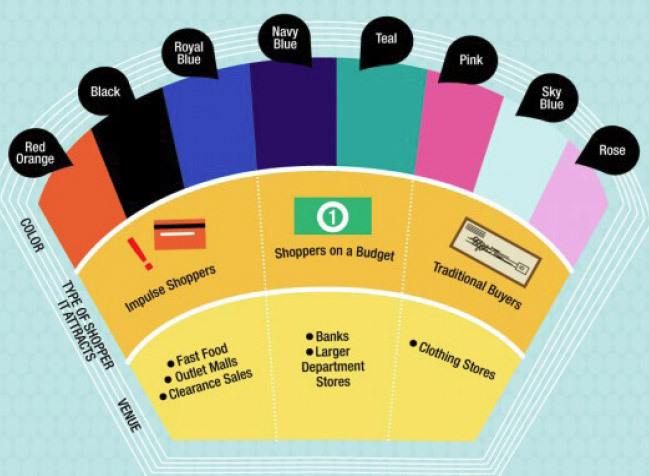 Color and Consumers: Color can attract specific types of shoppers and change shoppping behavior. Fascinated with the power of color? Consider taking classes on the psychology of color or even becoming a color stylists or color designer. According to the career planning resources at i have a plan iowa, these are two careers that have a very rosy future. How much caffeine are you REALLY consuming daily? If there is a lot of contrast between the color of the plate (and the food that's on it), our mind tricks us into thinking that we are eating more than if there is little or no color contrast. So, we walk away feeling satisfied but eating less.